PHP is by far the most favourite scripting language when it comes to websites. Our servers run different versions of PHP and customers are free to choose the version they like. This is accomplished using the PHP version selector in cPanel. The post describes how versions can be selected based on your requirements. It’s very easy to check version and update PHP, as we will show. First, login to your cPanel account using the username and password provided at the time of sign-up. If you forgot the details, you can reset it by clicking on the ‘Reset Password’ option at the bottom of the login box. Once you are in the dashboard, go to Services -> Select PHP Version option. It will take you to a page which lets you modify the PHP settings. It displays the current version of PHP installed in the server. As shown in the image below, you cna check the version that is active. The current PHP is 5.4. There is a drop down box beneath it which displays the various PHP’s available and you can choose among them. That’s it !! 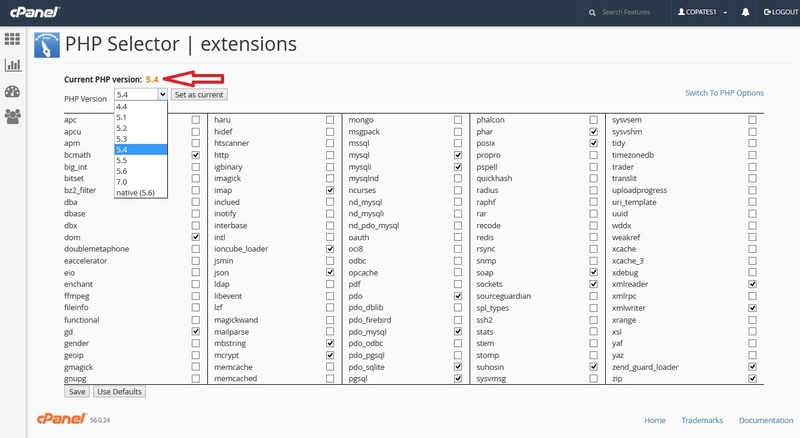 Updating PHP versions and enabling or disabling php extensions is as easy as that via cPanel.